This is the latest in a nice series of posts called ‘The Rules and How to Break Them‘. Like the other Guides we have put together recently, it now has its own homepage, here. You can navigate to that page by clicking on the ‘Style’ section of the navigation and selecting it from the drop-down. You can also see a full list of the pieces on the right-hand side of this post. I hope you find them useful. In this series, which started a few years ago on Permanent Style, we explain why a rule or convention exists in menswear, and then how to break it. The two things are closely connected. It’s usually only possible to break the rules well when you know why they are there, and therefore what you are giving up. It is often said that a double-breasted jacket (a DB) should always be kept buttoned – in some versions, even when you’re sitting down. Why is this? Well, primarily because a DB has cloth that overlaps at the front, and therefore when it is not done up, there is an excess of material at the front that can flap around. Of course, any well-cut jacket looks best when buttoned (otherwise there would be no point having it well made and cut), but this is particularly true of a DB, given the overlap. Does this also aply when seated? Well, the effect is less, but there is still rather a pool of cloth when the jacket is unbuttoned. You’d have to remain rather upright, but the jacket will look best done up, and perhaps you should start that way. Personally, I keep it buttoned if I’m at a table in a meeting, but quickly unfasten it if sitting in a restaurant with friends. So, it’s pretty clear what’s being given up if a jacket is left unbuttoned: fit, line, and the avoidance of flapping cloth. But you might still want to break the rule, and here’s why. Lovely as a DB is (and it is – it can be so flattering and masculine), the style is always at risk of looking formal or old-fashioned. Few people wear a DB today, after all, even in offices where a suit and tie is required every day. Partly that’s because it’s hard to get a good one off the peg, but mostly it’s because of those two risks: of looking over-smart and anachronistic. The suggestion might be that you look like your grandfather or a fat-cat banker, but the risks are significant either way. Jake: No.2, Alex: His own invention. The easiest way to avoid this and make a DB seem more relaxed in the way you wear it, is to disrupt its clean, sharp lines. These methods can all sound a little contrived. And they often are, at the start. But over time they become second nature, in the same way I still roll my shirt sleeves up twice because that’s how my father did it. At some point I must have seen him roll his sleeves (at a young and impressionable age) and I’ve always done it that way since. Anything else feels odd. You can often see the same habits with men that wear DBs a lot. They start putting their hands in the pockets, and over time it becomes routine. I use my trouser pockets heavily anyway, but if I’m wearing a DB I will instinctively pull back the jacket cloth as I do so – per number 1. I also do that if it’s a hot day and I want to have the jacket undone, therefore avoiding waist flapping. Others use the jacket pockets. Personally I’ve always found number 3 a little mannered, but perhaps it wouldn’t be if I did it every day. Rules exist for good reasons. But there are also sometimes good reasons on the other side. Understanding them, weighing them up and acting accordingly is the key – rather than blindly following one or the other. Never trust someone who baldly states a rule without explanation or qualification. You can follow the discussion on The rules and how to break them 8: Button a DB by entering your email address in the box below. You will then receive an email every time a new comment is added. These will also contain a link to a page where you can stop the alerts, and remove all of your related data from the site. 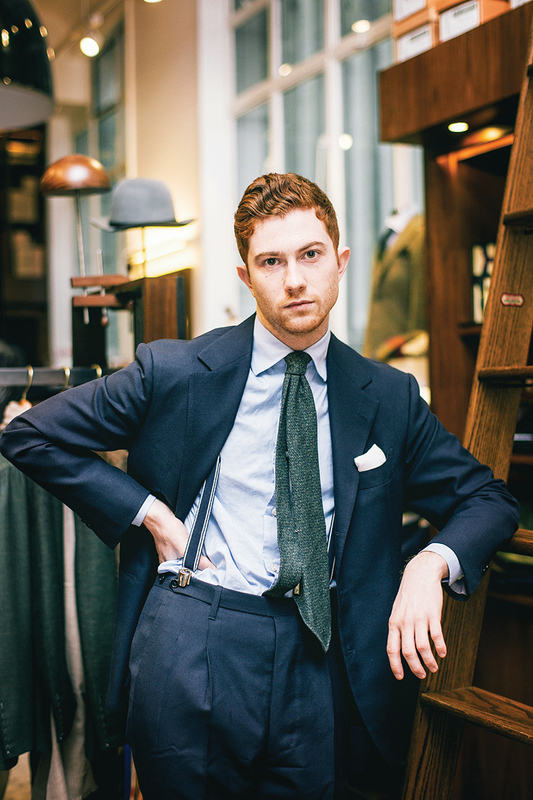 I love this pic of Chad Park (B&Tailor): https://b6c18f286245704fe3e9-05e2055f4cd9122af02914269431c9f6.ssl.cf1.rackcdn.com/20185040_chad-park-btailorsourcemore_tbe6bf53b.jpg. Having a vertical frame around shirt/tie but with more fabric than usual looks very pleasing. What do you mean by rolling up shirt sleeves twice? Two rolls, so they sit mid-forearm rather than above the elbow? Yes, that works well, though perhaps more of an issue when moving? Chaps roll their sleeves up below the elbow, blokes above the elbow. Do you know who made the blazer in no.4 ? Of course how stupid of me not to recognise the great Valentino ! Will you commission a Sciamat jacket at some stage? I appreciate it may not be your favorite style but their technical and stylistic pitch calls for a review, doesn’t it? Some minefields and ten-foot bargepoles here. Whether one looks old-fashioned, contrived, stiff, or anachronistic depends on so many outside factors, most of which bear no relation to tailoring or the clothes themselves. Celebrities, for instance, get away with anything. Because people don’t just look at the clothes. They look at the wearer. Ditto for executive jocks or the upper class. The confidence, good breeding, inherited money, and loadsamoney afford them a lot more style leeway than us mortals. Then there’s haircuts and facial hair, and wrist accessories. Someone with a classic short-back-and-sides will look odd if they practise extreme iSprezzatura. And let us not forget body shape. Tall can get away with most things. Tall and thin can get away with anything. Finally, there’s circumstance and environment. A supermodel hanging on your elbow will get you into the most exclusive clubs known to man. She will also let you get away with breaking sartorial rules. Add champagne and perhaps a cigar, and you’ll look good in anything. That’s a reason why sartorial brands trying to market their softer, relaxed sprezz outfits base their marketing on photoshoots of tousle-haire young men out on the town, and not young men in the boardroom. Ambience is nine tenths of the sartorial game. I won’t mention names, but Drake’s is one example. Misshapen skint blokes belonging to the lower orders (I won’t mention names, but that would be me) find rules to be very helpful. Thanks Robert – would you then do none of 1-5? Or perhaps just 1, for example? I’m absolutely with you Robert. Cover the face before you consider anything. Class, confidence, ambience, good looks – 98%! I don’t think i could pull off 1, 2, 4 or 5. I might try number 3 if I ever have a DB again. It relaxes the formality but keeps the nice lines and good fit of a DB. I will have to go along with some of the more sceptical tones here. I am a bit non-plussed as to why you would go to the effort of wearing a jacket meant to be flattering and well fitted then deliberately pull it out of shape? 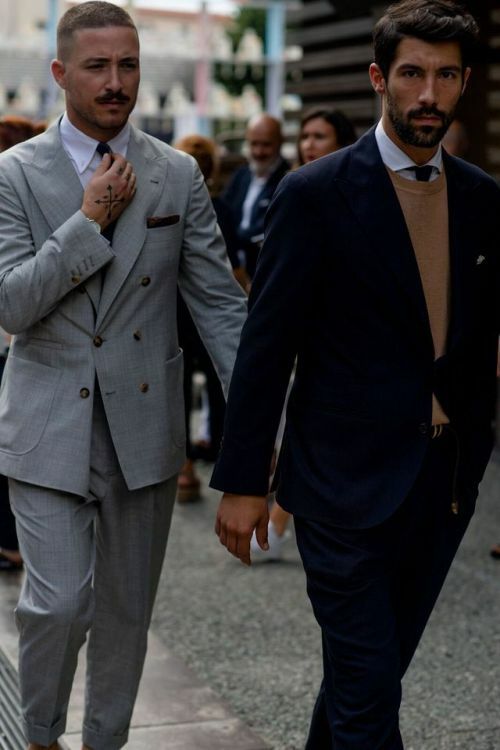 I’ll go along with the hand in trouser pocket to give a slightly more relaxed, at ease look but some of the others could trespass into an affected look. (Putting your hands in jacket pockets to me either looks contrived, as when the hand is held fingers straight, thumb out like certain royals and senior politicians or pulls the cloth and cut right out of shape.) If you must give off a certain air why not just dress in something appropriate? Not having a go at anyone here, just thinking along the lines of the adage of dressing then forgetting about it. Interesting thoughts Kev. I think it makes some difference if it’s something you only do part of the time. Eg I have my shirt sleeves cut to a perfect length, yet also happy to roll them up. 1, 2 and 5 are fascinating – because I’ve never seen them written down, and have never considered that others might do them on purpose too. I’ve started wearing high-waisted trousers this summer (stoffa) and as such I’ve developed a number of new habits – which include a variation on 5. I wanted to test out an old and unloved RTW DB linen jacket with them, probably my worst fitting, and so wore it undone to try and hide the poor fit around the waist. But to get it to look right I found that I naturally started putting my right hand in my trouser pocket – and using the arm to push the part of the jacket back behind towards the right (if that makes sense, its hard to explain without a diagram, but its sort of like Jake is doing in the photo below, but instead of staying on the hip the hand goes all the way to into the trouser pocket). This keeps most of the jacket in a better place, while lifting part of it up a little and retaining some room for natural movement. This obviously has the effect of looking more relaxed, but also more interesting by virtue of being more unusual – and as a bonus getting to showing off those lovely trousers. Its also such a bizarre thing to do on purpose that it always looks totally accidental, even though its heavily considered. Now that jacket (wrongly) get more compliments than any other item I own – and I have noticed myself subconsciously doing my odd pocket manoeuvre regardless of what I’m wearing, having become a natural mannerism that I don’t even notice myself doing. Everything seems to look that little better for it, and the gesture has become as much part of my personal style as any actual item of clothing. Glad to know I’m not the only one! All three of your DBs look very nice. Are they by MD and Cifo twice? These Cifo sleevehead ropes look very wide and fully filled with cotton rather than just a cigarette and empty space inside. Is it full indeed? I notice your sleeves are rather ample at the arm level. Does it make you look more casual? The sleeveheads have sleeve wadding in them, yes, but just around the top – pretty standard construction. Correct me if I am wrong but you did not mention fastening the lower outside button rather than waist button. Why? This is very commonly employed and makes a DB more casual. No, you’re right. I wasn’t listing all the ways to make it more casual, just the ones that break up the lines. On the double-breasted jacket: a few thoughts. 1) You should not put your hands in the pockets, particularly for the sole purpose of feeling more comfortable wearing a certain garment. 2) If you don’t feel totally confident wearing a double-breasted jacket without resourcing to one or more of the tricks pictured above, don’t wear it. There is nothing wrong with that. 3) Yes, John Fitzgerald Kennedy used to put (occasionally and for a very brief moment) a hand on one of the lateral pockets of his single-breasted jackets (he never wore DB jackets after becoming president). So does Prince Charles with both, his DBs and SBs. For both gentlemen it is more like a sort of nervous tic (similar to biting the nails, which prince Charles -take a look at his hands- also seems to do, but never in public). 4) Prince Charles buttons the middle and the lowest button of his DBs, reminding us of their military origin. Many of us in other sites and most of the style experts have criticized him for this “horrendous” habit. The truth is that he is in a different planet in terms of style and he is definitely able to “pull it off” (mostly because of who he is). I certainly wouldn’t be able. 5) I sported my first DB when I was 18 years old. It was made by my father’s Milanese tailor (yes, I am still a fan of Milanese and British tailors; Neapolitans don’t thrill me at all). I told him once that I felt a bit self-conscious wearing it. Since he was an ex navy officer and loved wearing DBs in his civil life, this was his advice and it worked for me: “Don’t ever open it, don’t put your hands in the pocket just to feel confident, cool and smart. Walk down the street pretending to be an admiral wearing his blazer with metal buttons, that is straight and proud. A navy officer wearing his blazer wouldn’t be permitted to open his jacket’s buttons or put his hand in the pocket”. I repeat: it worked for me and it still works, even though I no longer pretend to be an admiral: wearing a DB has become second nature for me. 6) Sorry to say the following, but I don’t want to let anything in: none of the gentlemen in the above pictures other than you (in fact, in a couple of pictures you don’t have your hand in the pocket) are able to “pull the DB thing off”. They all seem to be self-conscious individuals trying hard to be smart and cool or to work some of what we in Italy call “sprezzatura”, that is “nonchalance”. 7) Dear Simon, I didn’t want to be disrespectful at all. On the contrary… I thank you for your very detailed and informative article and for the opportunity you give me, your follower and fan (and all your followers and fans) to express my opinions on this subject, which, in view of the fact that I am a DB guy, is very dear to me. I also would like to clarify what I previously stated about fastening the lower button: it has nothing to do with self-consciousness. It just elongates my figure since I am only 5’8”, even though sometimes I also, as most people do, fasten only the middle one: it depends on the mood. I have always thought a DB with a Tautz lapel, a horizontal gorge and somewhat rounded peaks, is much more attractive the the current trend of high gorges and sharp peaks which in some cases seem almost to reach the shoulders. Also a lower button stance does much to elongate the torso and eliminate the boxy look of some DB’s. These are very helpful pieces of advice indeed. But I wonder whether a real game changer wouldn’t be a consistent effort by big Houses that have RTW lines to reintroduce the navy DB blazer or DB jacket in whatever color as a mainstay of their collections. The DB blazer has lost its traditional territory for quite some time that first and foremost needs to be retaken. But such a task would require a collective and unflapable commitment, I’m afraid! 2) When seated, however, one had to keep unbuttoned all functioning outer buttons whilst keeping the inner, jigger, button securely buttoned. These were the old and established rules, they told me, simple rules, the middle way between maintaining a classic profile, important!, and being comfortable, which of course was less important. They could know, being born at the beginning of the twentieth century, or even slightly before that, into the upper and mostly well dressed classes. Really interesting, thanks, and better written than some English commenters! That is exactly how it should be worn, Gijsbertus. The jigger is never undone; top buttoning always attached whilst standing but released whilst sitting. Bottom button never attached (even if HRH does attach it). So those are the rules, which of course are there to be broken. Indeed, the shank of the jigger being a bit longer makes being seated with that button closed and all others undone a bit more comfortable. But at the same time, not too comfortable. That is the essence: form, classic form, and conforming to these, and therefore being formal by definition, was de rigueur in the era of my stylish and classic ancestors, not comfort. I think this is the essential difference between these people and us: we value comfort, perhaps more than form. To them such an attitude would be anathema. Nevertheless, even to them a measure of comfort was not unwelcome, hence, perhaps, the length of the jigger’s shank. One wonders if the tailors of their day and age knew more techniques to somehow combine formality with at least a bit of comfort. Techniques that perhaps have been lost since then. My understanding is the jigger has to have a slightly longer shank to allow it to be buttoned easily, and give some movement to the inner layer of the jacket. On comfort, yes people certainly put up with more discomfort in the past. But it’s also worth noting that this push against formality in favour of comfort has been going on a long time. Almost a century ago, many of the Duke of Windsor’s innovations were to make things easier (eg a zip fly) and even the creation of the dinner jacket, again as an easier alternative to tails. Always striking how many of the style icons people look up to continuously broke all the rules (knowing, of course, why they existed). And yet those same people might be the first to insist things should be done a certain way today. 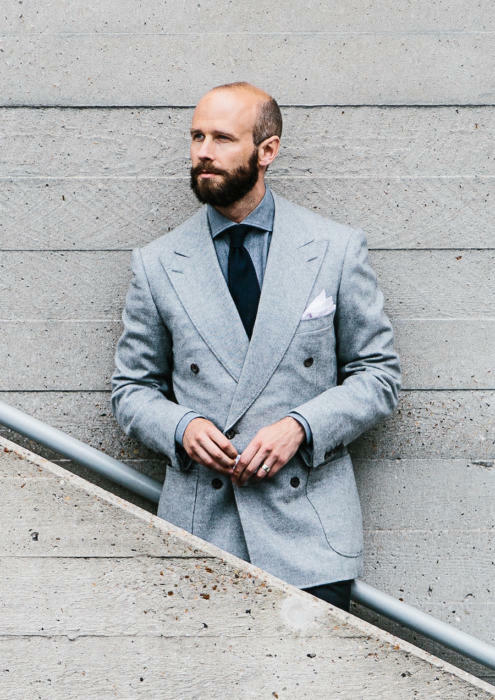 I’d like to second Gijsbertus here.. just don’t wear or order a DB if you don’t feel 100% comfortable in it. Resist the iGent peer pressure in your head, you can! Given there are so few decent DBs available RTW you’ll most likely end up laying down serious money for something MTM or bespoke, only to try (too?) hard to make it look imperfect afterwards. Sounds a bit silly, really. If your budget has limits get a(nother) great SB instead and live in happily ever after. Or proudly embrace the DB for all it may stand for (in the minds of others) and let it shine at its fullest. I can certainly relate to the hesitation of wearing a DB and have been down the i-absolutely-need! !-one-but-then-hardly-ever-wear-it road myself. But then again, every time I do get to wear mine, without thinking too much about how to make it look like I’d rather be wearing something else, I tend to get complimented for it. Just be aware of the occasion, as always. 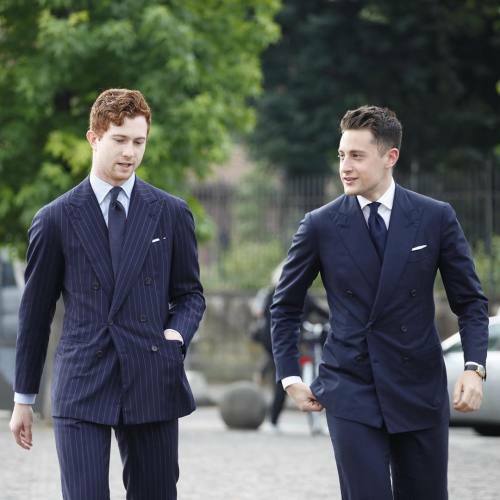 I agree with Oskar and Gijsbertus, especially with regard to the traditional navy DB blazer. One should wear it with panache and good posture, fully embracing its naval and military associations. The slouchy hipsters in the pictures above (not you Simon!) manage to look both ridiculous AND self-conscious in their attempts to wear a traditional garment with ironic nonchalance, a’ la David Letterman. But then again, that’s the whole problem with sprezz, isn’t it? It is fundamentally mendacious – an attempt to look as if you didn’t care about your appearance, while caring about it very much indeed. 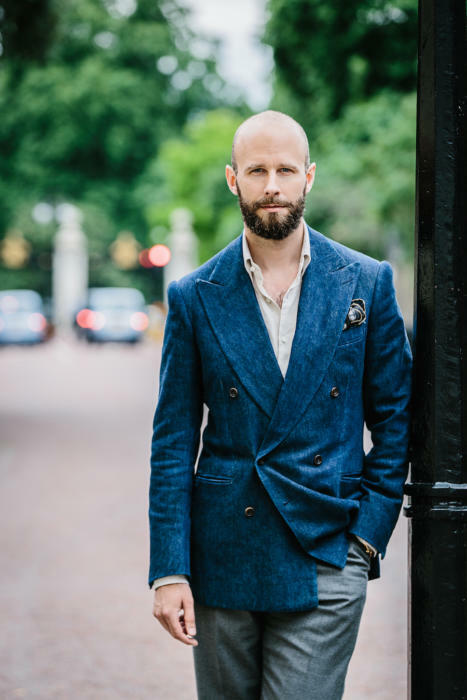 I have been partial to the traditional DB blazer since the age of fifteen or so – I love its traditional aura and its masculine, chest-broadening effect. Who exactly decided that it is stodgy and makes one look like “your father or a fat cat banker”? The hipsters in their shrunken suits that make them look like ventriloquist’s dummies? Besides, what’s wrong with looking like your father? My father was one of the best dressed men I know, and I try to emulate him while at the same time cultivating my personal style. In the final analysis, if you deface the beautiful, clean lines of an expensive bespoke garment in an attempt to look “hip” or out of fear of “what will others think” you are fundamentally disrespecting it and the craftsman who made it. Thanks Dan for not including me! – Society as a whole decides that this is how a DB is viewed. It cannot be controlled, and it’s certainly not down to a few individuals. Most in my office would view it that way, as much as fans of tailoring might hate the fact. 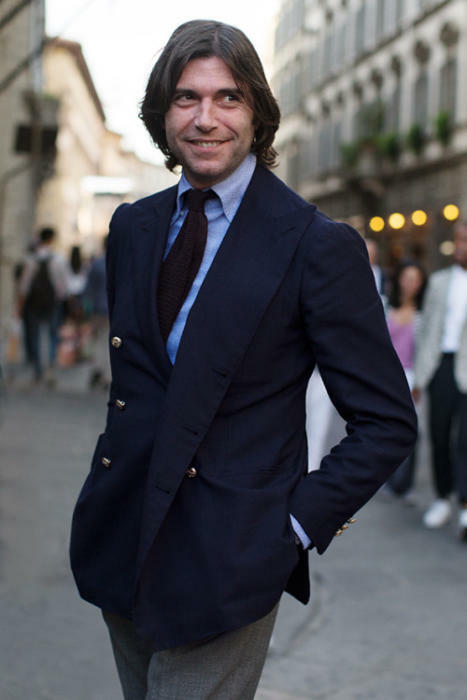 Secondly, I am a University professor and as such can wear pretty much what I want to the office, including occasionally a DB blazer, but I might concede that that type of garment is more suited to an evening out or an elegant daytime occasion than to the office. I would still insist, however, that wearing a DB blazer in an intentionally disheveled manner defeats the whole purpose of the garment. No, I wouldn’t say it has become a rule. Societies decide, and often have a visible mean, but there’s still decent variation around it. Also a lot of variation as to what the implications of those views should be for individuals. Norms about what is appropriate or inappropriate to wear are, in fact, dictated by society, not by individuals. On the whole, these norms are created organically and evolve spontaneously, just like languages. That said, the individual idiosyncratic choices of high profile individuals (like presidents, royals, and celebrities) can exert a disproportionate influence. For instance, hats went by the wayside in America because the youthful JFK rarely chose to wear one. After JFK, it was difficult to wear one without looking like an old fogey. But all of this was happenstance; I don’t think JFK was intentionally trying to shape fashion trends. That said, cultures can also vary tremendously on a local level. So for instance, DBs are commonplace (relatively speaking) in NYC but extremely unusual in Houston, so can get a very different reaction depending on where you wear one. Same goes for an office environment–bankers wear them commonly, doctors never wear them, and attorneys only wear them on occasion. I love the formality of a DB suit, ideally a navy chalk stripe. It’s classic and stylish, not old-fashioned. DBs are the total opposite of the tight-fitting and short SB jackets that currently dominate menswear. The 5″looks” are, as you suggest, contrived. 2 and 3 look crumpled, even slovenly. 4 and 5 are just narcissistic poseurs. I’d rather look like a fat cat banker than an iGent sheep or a menswear “model” that few have heard of. Irony abounds: the very attempt to codify nonchalance and the fact that the more we codify nonchalance the less convincing those codes. 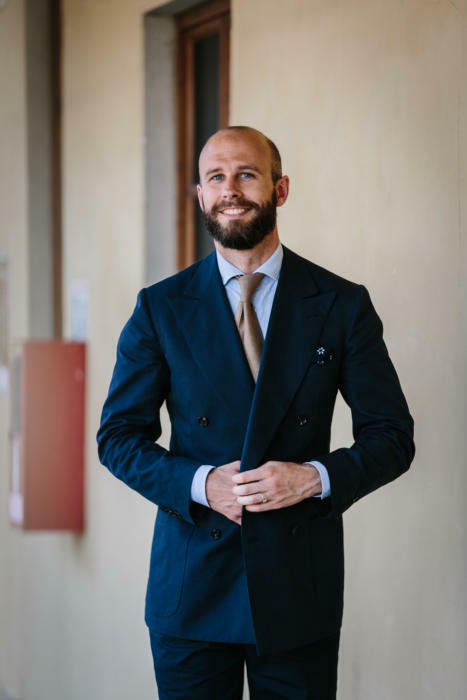 If you go to Pitti you’re fastidious—even if you’re not. I think solid DBs suits look great—love your Vergallos and MDs—but even I hold their fat cat association. The more nonchalant the better. I’d be surprised if the Anglo-Italian gentleman ever fastened a jigger and doubtless stuff their pockets with keys, phone, wallet and all sorts more than just their hands – perhaps more functional after all. Valentino and George look like they can pull off any look they wish with style. 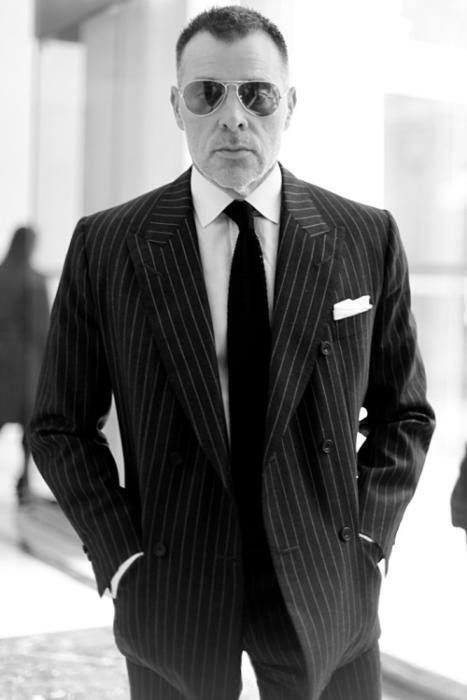 I agree with your take on the dangers of DB: people tend to look either outdated or rakish. My office in D.C. has about 150 male attorneys and I’ve yet to see a DB. For that reason, I can’t really see getting a DB for work purposes, but I am thinking of getting one for going out. About once a month, I have a night out with the boys and my wife goes out with the girls. (The kids stay with my grandparents–a perfect arrangement!!!) The gents tend to gravitate to a bar followed by one of the many steakhouses in D.C. We all tend to dress very smartly for the event, which makes it a lot of fun. Do you think a jacket would be a better move than a suit for a DB for this type of occasion? Also, I’m somewhat short (5’7) but have a pretty athletic build (relatively wide shoulders for my height and a 37 inch chest). What sort of buttons do you think would be the most flattering? Yes, I think a jacket would likely be best. 6: If you come to Germany do not put both of your hands in the trouser pockets. It is considered very ill manenred and of poor education equal to poking in your nose. Same here in the Netherlands. When greeting people? That makes sense as one should not greet people with a hand in pocket or do you mean at any time. I.e. standing alone somewhere? Yep. No hands in any pocket at all. I cant decide on a double breasted dark grey pinstripe ( like the owner of Zaremba wears in that well known picture of him) or a double breasted chalkstripe. I think both double the risks discussed in the post here Bas – having a stripe makes it even more likely a DB will be too formal or anachronistic. It all seems very laboured to me. If you really have to try so hard to make a double breasted jacket work, why bother? There are plenty of other options. Personally, I don’t believe you can dress down a double breasted jacket. It’s just too formal. I was thinking about this very topic not 3 days ago: how to relax a DB. I read every comment. All of you guys are completely nuts. And I love you for it. I totally agree with you. And yes, our passion for dressing style makes us all nuts: my wife says it too. Hi Simon – long time avid reader, first time poster. Really appreciate all the advice and feedback. Not sure if this is the right medium / the right place, but was hoping to take your input on an idea I’ve had. I’m thinking of having a brown tweed DB jacket made by A&S, possibly in the Harris Tweed 89202 from Holland & Sherry you had a jacket made in. Tweed and A&S cut seem like interesting ways to slightly dress down the DB, and tweed DB would really come in handy in the painfully cold climate I’m in (US midwest). Having said that, I’m worried the outcome might look quite bulky, and that thick tweed wouldn’t be very compatible with a DB. I love DB suits (not just because my initials are DB either). All my suits are DB, and all but one of my sport coats are single. I think it largely comes down to fabric and cut on how you should wear a DB, especially with regards to the lower button. I have a grey glen check flannel from Brioni, very formal cut, high and wide button stance, and the pattern makes it a bit over the top, but if I don’t do up the bottom button, it looks very unfinished. Like I forgot to do up the bottom button. I tend to wear it with black double monks. It’s basically my winter power suit, and my posture supports that. However, my summer DB is Neapolitan (Isaia) lower, narow buttons, EXTREMELY light weight material, soft shoulders, dark blue glen plaid (brown for the glen and white over check), if I do up the bottom button on that suit, well, let’s just say I can see why people say you never should! I only do if the wind is blowing it around too much, but undo it once indoors. So there are two different styles, that if you ask me, demand being wore two different ways. And I can see how if you are only familiar with one or the other, you can see why there are two sides to the “bottom button” rule. My stand alone DB is middle ground. It’s white linen, almost vintage Isaia. It’s ventless, full in the sleeves, wide and high buttons, and can be worn equally well with bottom button done or undone, I can even wear it with the jigger done, and only the lower outer done up with I really want to play fast and loose. Point is, it dependson the cut and material if the suit, how you should wear it. A point I think is evidenced historically by vintage men’s ads from the DB hay day of the 30s, formal jackets TEND to be fully buttoned, while separates and lightweights tend to only be the upper. I feel as tho this rule came about in the later half of the last century, when a lot of things didn’t make sense styalistically. I also tend to wear my DB overcoats either fully buttoned or full open.